Terry M. Buster, Sr. is a third generation pastor living in Phil Campbell, Alabama with his wife of 47 years, Sue. Terry & Sue have three children and fifteen grandchildren. With the style of a teaching pastor, Terry preaches through books of the Bible with an eye on how one passage of Scripture speaks from the foundational message of all the Bible. Currently, he is Pastor at First Baptist Church, Phil Campbell, Alabama. 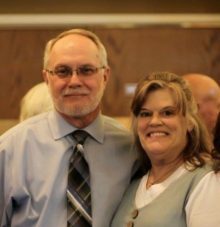 Terry has served churches in Oklahoma, Missouri, and Alabama over thirty years. While his primary commitment is to his congregation, he has made time to be part of other ministries ranging from participating in his local ministerial alliance to chairman of the board of Hannibal-LaGrange University, a Missouri Bapitst Convention entity. He was honored to serve his country in the 4th Infantry Division from 1973 to 1976. Terry earned a Bachelor of Music Education degree from Oklahoma Baptist University from Oklahoma Baptist University and a Masters of Divinity from Southwestern Baptist Theological Seminary. His hobbies include reading, playing trombone, and sitting on the front porch drinking in the wonder of God’s creation.